The output of convolution with the low-pass filter should look something like Figure 1. Observe that the arguments to the kernel determine its size and coefficients. Specifically, with the units parameter set to pixels, the radius parameter specifies the number of pixels from the center that the kernel will cover. If normalize is set to true, the kernel coefficients will sum to one. If the magnitude parameter is set, the kernel coefficients will be multiplied by the magnitude (if normalize is also true, the coefficients will sum to magnitude). If there is a negative value in any of the kernel coefficients, setting normalize to true will make the coefficients sum to zero. Figure 1. 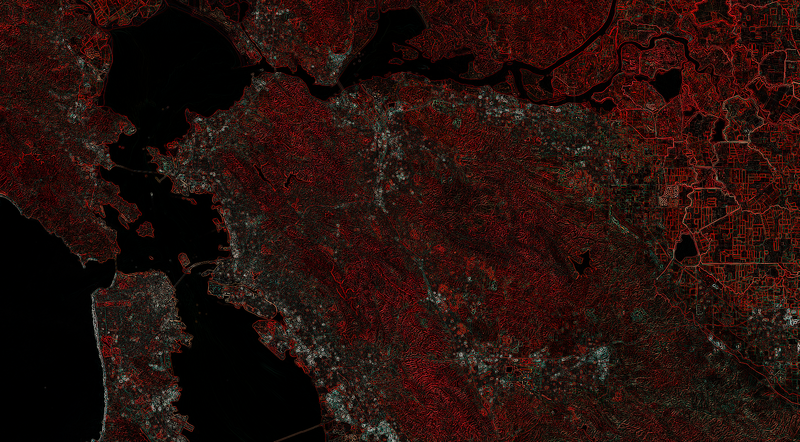 Landsat 8 image convolved with a smoothing kernel. San Francisco Bay area, California, USA. Note the format specifier in the visualization parameters. Earth Engine sends display tiles to the Code Editor in JPEG format for efficiency, however edge tiles are sent in PNG format to handle transparency of pixels outside the image boundary. When a visual discontinuity results, setting the format to PNG results in a consistent display. The result of convolving with the Laplacian edge detection kernel should look something like Figure 2. Figure 2. 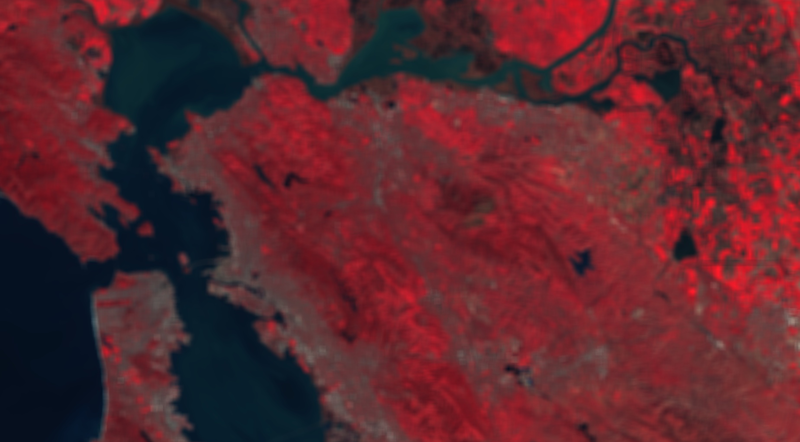 Landsat 8 image convolved with a Laplacian edge detection kernel. San Francisco Bay area, California, USA.